Add non-visual geoprocessing functionality to any Pascal app (testgdal, testshapes). Develop a GIS app using the new GIS map and legend controls for Lazarus LCL (PasCast). Simple mapping with a mobile Web app (QxCast) that uses a Pascal FCGI server app. Simple mapping with a standalone app (SwiftCast). Clickable read-only map with a Web app (AspCast). Clickable read-write map with a GIS plugin (PyCast). All of the *Cast example apps use the same Pascal dynamic library that retrieves weather forecast data via the National Digital Forecast Database (NDFD) Web service. OpenGPSX Lazarus Component for GPS Interface programming. 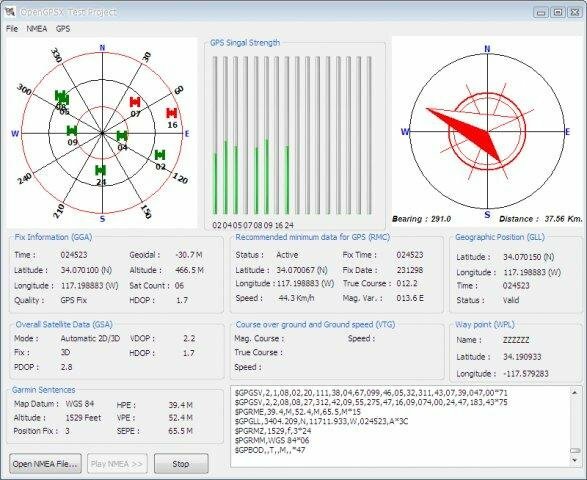 Decode NMEA messages, Display GPS skyplot view, Display GPS signal strength, Display target navigation. Cross-platform, Now works on Windows and Linux. This page was last modified on 22 February 2019, at 13:27.